At least 141 people, most of them students as young as 12, have been killed and more than 100 others injured in a Taliban seizure of a military-run school in the city of Peshawar, Pakistan, according to provincial authorities. The numbers of dead and injured may still rise as the casualties of the assault are counted. The army told AFP that the number had risen to 141 late Tuesday afternoon, up from a previously cited figure of 130. 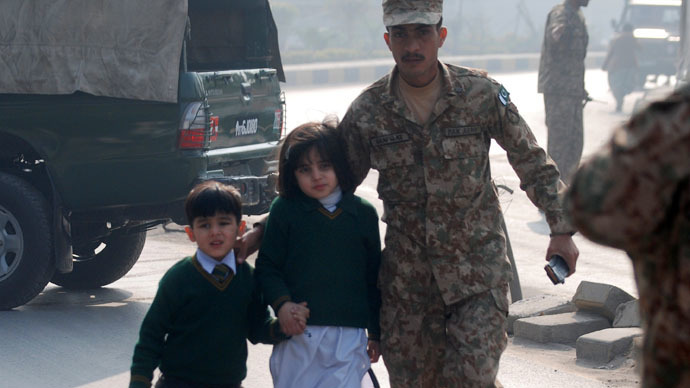 Some 500 students and teachers were in the Army Public School on Warsak Road at the time of the attack. Pakistan’s military said most of the civilians escaped, but some had been taken hostage by the assailants. Several militants dressed in Pakistani military uniforms entered the school compound on Tuesday at around noon. They torched a car at the site and proceeded with a raid on the facility. “Seven to eight people attacked us, then an army soldier came to us and he asked [the] principal and teachers to take the children out of compound from the back gate. There were thousands [of] students in college. They were moved to auditorium, they can’t come out until the fight is ended,” Arshad Khan, a student at the school, told RT's Ruptly. The Pakistani Army responded to the emergency, dispatching security forces to cordon off the area and sending military helicopters for surveillance. A commando force arrived at the site. “As the firing started our teacher asked us to bent down and we went to a corner of the class, after one hour when firing reduced, [an] army officer came and rescued us, but as we came out we saw on the way in corridors our friends were lying dead on ground hit by bullets, some with three, some with four bullets. They were bleeding,” another student, Muhammad Naeem, said. Two loud booms of unknown origin were heard in the early afternoon, according to AP. In the ensuing battle with Pakistani security forces, nine militants were killed, according to the military. One of them is said to have detonated a suicide vest he was wearing, accoridng to local media. The operation drew to a close shortly after 7pm local time, a Pakistani military source told Reuters. "The operation is complete," he said after the nine hour battle concluded. Seven army personnel were wounded in the struggle. At least one Pakistani soldier was reported killed in the gun battle. The military said their progress in clearing the school had been hampered by booby trap explosives left behind by the attackers. Gun shots and explosions seriously damaged the school building. Pakistani Prime Minister Nawaz Sharif called the attack on the school a national tragedy and said he would personally supervise the army operation in Peshawar. "I can't stay back in Islamabad. This is a national tragedy unleashed by savages. These were my kids," he said in a statement. The provincial government declared three days of mourning over the tragedy. The Taliban claimed responsibility for the attack, but claimed it was not targeting the pupils. "Our suicide bombers have entered the school, they have instructions not to harm the children, but to target army personnel," Taliban spokesman Muhammad Umar Khorasani told Reuters. The militants, however, see older students at the school as legitimate targets for their attack. The Taliban said it staged the attack in retaliation for the Pakistani Army’s ongoing operations in the North Waziristan tribal area. It said it had targeted the school because “because the government is targeting our families and females” in the military operations. "We want them to feel the pain," Khorasani said. The US has condemned the school attack “in the strongest possible terms”. “We stand with the people of Pakistan, and reiterate the commitment of the United States to support the Government of Pakistan in its efforts to combat terrorism,” said a statement from the White House. The school assault in Pakistan is a seemingly new tactic for the Taliban, which has tended to attack security checkpoints, police stations, security troops and other targets of military value. Its strategy has been to avoid civilian casualties to some extent, since it finds recruits, financial support and informants among the population caught in its war with the Pakistani government. However, the Taliban has attacked girls’ schools, which the group deem un-Islamic, and has targeted political activists, such as this year’s Nobel Peace Prize winner Malala Yousafzai. But the tactic of indiscriminately killing children is painfully familiar in Russia, which experienced one of its worst hostage crises in September 2004, when a group of terrorists seized a school in the North Caucasus town of Beslan. The siege of the school, where 32 militants held over 1,100 people at gunpoint, including 777 children, lasted for three days. With tension alarmingly high on the third day of the stand-off, several blasts inside the school triggered a chaotic chain of events. Russian security forces and local militia made a desperate attempt to storm the building and save the hostages in apparent danger of being slaughtered. The militants opened fire as hostages tried to run for their lives. The long siege and gunbattle claimed the lives of more than 330 hostages, including 186 children.